The Galisteo Basin Watershed is celebrated for its spectacular scenic, wildlife, and cultural resources. Covering 730 square miles just south of Santa Fe, the Galisteo Basin’s varied geography includes grasslands, forests, mesas, rolling hills, rocky escarpments, streams, small lakes, and wetlands. The watershed lies across three counties: San Miguel to the east, Santa Fe in the center, and Sandoval to the west. The Galisteo Basin lies at the intersection of four western ecoregions: the Southern Rocky Mountains, Arizona/New Mexico Mountains, Southwestern Tablelands, and Arizona/ New Mexico Plateau, each contributing to a rich biodiversity. Regionally, the Galisteo watershed serves as a wildlife linkage area—for cougar, black bear, mule deer, and potentially elk—between the Southern Rockies Wildlands Network and the area encompassed by the New Mexico Highlands Wildlands Vision. The Southern Rockies Wildlands Network and the New Mexico Highlands Wildlands Vision are two prominent regional green infrastructure planning initiatives that have been developed in the past by consortia of national experts and organizations concerned with conservation biology. Galisteo Creek and its tributaries form a functional wildlife corridor network that establishes the linkage between the ecoregions. Additionally, the surface water drainage system also forms a regional and local hub of water resources and water related ecosystems of riparian zones and wetlands in an otherwise arid landscape. The riparian and wetlands system of the watershed serves in particular as a small stepping stone (i.e., an “island”) for waterfowl and other migratory birds that follow the alternative eastern fly routes parallel to the Rio Grande. The Galisteo Basin is complex and nuanced landscape containing the material record and place-based cultural heritage for generations of ancient and modern peoples, extending back more than 10,000 years. The federal government recognized and protected the prehistoric Native American archaeological value of the watershed in the 2004 Galisteo Basin Archaeological Sites Protection Act (S.210, H.R.506). The Act specifically seeks protection for 24 sites of immense prehistoric significance, including several large pueblo ruins and petroglyph sites. It is this richness of culture and wildlife, coupled with its raw natural beauty that makes the Galisteo Basin and critical region to protect. The Galisteo Basin Watershed was adopted several years ago as a landscape in need of protection, and we established a conservation goal of conserving 50,000 acres. 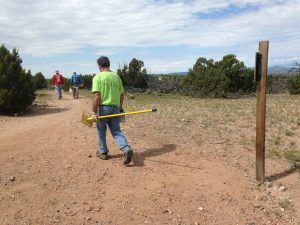 SFCT, along with Earth Works International and Earth Analytics, undertook the Galisteo Watershed Conservation Initiative (GWCI), an initiative that created a plan for the protection and restoration of the basin’s watershed resources. At this time, SFCT began working closely with Commonweal Conservancy at their Galisteo Basin Preserve, a conservation development, on a common goal to conserve over 12,000 acres of land for wildlife, prehistoric, and public recreation purposes. Within the Basin is the Galisteo Basin Preserve (GBP), a large-scale, community stewardship initiative spearheaded by Commonweal Conservancy. Designed to permanently protect more than 12,000 acres of open space, wildlife habitat, and cultural resources in the Galisteo Basin, the Galisteo Basin Preserve is considered a “keystone property” in the region; inappropriate subdivision into widely distributed, large-lot “ranchettes” would irreparably compromise the region’s scenic, wildlife habitat, water, historic, cultural, and traditional economic values. SFCT now holds 13 conservation easements on 3,971 acres of the GBP and plans on receiving an additional 10,000 acres in the future. The Santa Fe Conservation Trust and nineteen landowner partners protect 11,899 acres in the Galisteo Basin Watershed.